We provide best-in-class health, fitness and sporting retreats from our own Chateau in the Pays de la Loire. Set in over 9 hectares, our state-of-the-art leisure facilities and our dedicated professional team set us apart and help you enjoy every moment . Retreats are based both on our holistic approach to training - improving mind, body, technique and diet and our focus on each individual - providing 1 on 1 time as well as activities within the group. Attention to you and attention to detail. Relax, enjoy and evolve. Chateau de la Motte Henry is a beautiful, 19th Century Chateau set in over 9 hectares of glorious parkland in the Pays de la Loire. Easy to get to from the UK and mainland Europe, the Chateau is equipped with first class leisure facilities to allow guests to train hard and relax well. The spacious accommodation remains true to the Chateau’s heritage, updated for modern convenience. Our cycling retreats provide a truly unforgettable experience. Fully supported rides through the rolling terrain of the Mayenne, neighbouring Brittany and the Alpes Mancelles - often accompanied by ex-pro peloton riders. 1-1 expert analysis of your technique and your physiology. Bike transfers from the UK and goodie bags on arrival. On the road nutrition and all meals included (even café stops!). Evening massage and group social time set against the backdrop of our luxurious Chateau. This unique cycling holiday, based at our gorgeous Chateau in the Pays de la Loire, will encompass group rides led by ex-pro peloton cyclists with 1-1 assessments of your technique, physiology and biomechanics, delivered by degree qualified experts. You will ride to the highest point in Western France; cover local climbs included in the Tour de France; and experience the rolling beauty of the Mayenne and the Alpes Mancelles. All fully supported by riders and support vehicles. Once home you will enjoy delicious and nutritious meals, boutique style luxury accommodation; relaxing, therapeutic massage and post ride pilates or yoga. Our rehabilitation retreats are delivered in partnership with leading clinicians and therapists from across the globe to deliver impactful change. With very few places available, we will review your clinical history thoroughly prior to accepting you on our retreats. Accompanying family are welcome and a programme of local excursions and activities is arranged to ensure all our guests benefit fully from their time with us. Return to your sport fitter, stronger and more resilient to injury at our intensive 7 night rehabilitation retreat. Delivered in partnership with leading movement rehabilitation specialists at our stunning training facility in the Loire. You will benefit from tailored assessments, 1-1 therapy and individualised exercise programmes, all designed to facilitate your recovery. In addition, you and your family will be able to relax together in our stunning grounds, enjoy the luxury of our 'fairytale' Chateau and explore the charm, beauty and heritage of the Pays de la Loire. Leave us with fond memories and a clear understanding of how you can once more reach your potential. Our luxury running retreats, delivered in partnership with Yelling Performance, are perfect for newbies, veterans and serious improvers. Former international athletes and now leading coaches - Liz and Martin Yelling - are joined by knowledgeable sports scientists and therapists. We provide a level of support that treats you like an elite athlete, in an inspirational, boutique hotel environment. 1-1 assessments and group training sessions are tailored both to you and to your objectives. Join our Running Ambassador, former Olympian and Commonwealth Games medallist, and renowned coach Liz Yelling at our signature Run to Wellness retreat. Re-balance throughout the weekend, drawing mental and physical benefit from our mindful running, meditative and wellbeing program. Energise whilst enjoying the picturesque running trails and tracks in the Pays de la Loire. And relax at our stunning Chateau with its boutique style accommodation, stunning relaxation areas and market leading health and fitness facilities. Enjoy personalised fitness, nutritional and wellbeing consultations. Join daily stretching and fitness classes and supported group runs. Attend informative seminars and meet like-minded individuals whilst enjoying our nutritious menus. Evolve your running at our luxurious Chateau. Our 1.5km woodchip running trail, sports performance laboratory and well-equipped gym are brilliantly supplemented by the stunning towpaths, trails and tracks of the Pays de la Loire. Your running and fitness will be assessed 1-1 and training tailored to improve you, whatever your goals. Enjoy personalised fitness, nutritional and technical consultations. Join daily stretching and fitness classes and supported group runs. Attend informative seminars and meet like-minded individuals whilst enjoying our nutritious menus. Hosted by professional running coaches and former elite athletes. Get the most out of your training. 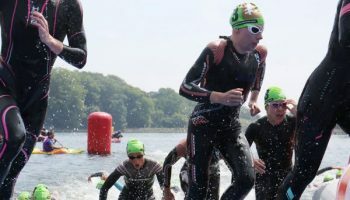 Our experts will assess your technique, physiology, mental preparation and diet, at a level of detail usually only available to elite athletes. 1-1 assessments will be conducted in parallel to group training sessions, all tailored to each individual. Traditional training in the 3 core disciplines will be supplemented by strength and conditioning and targeted recovery sessions. Enjoy our luxurious Chateau and its unrivalled facilities, all easily accessible from the UK and Europe. Be joined by elite coaches and household heroes from the triathlon community. Designed for active families. An on-site crèche caters for younger ones. Youth coaches “enter-train” your pre-teens. Budding athletes accompany you, but only when it is safe to do so! Enjoyable family excursions form part of the plan! And if your partner wants some r & r this can be arranged too. All will benefit from professional assessment, training and coaching advice. And it’s delivered by highly skilled professionals and attended by elite athletes at our beautiful Chateau. A memorable, luxury family holiday where you can train without the usual guilt. Tailored to you, enjoyed by all. Relax and re-energise in the luxurious surroundings of Chateau de la Motte Henry, at our exclusive wellness retreats. Whether your focus is fitness and diet, recapturing lost energy or simply having fun with friends; we have an unforgettable experience for you. Highly personalised, your retreat program will help you achieve your goals and our team of leading nutritionists, fitness professionals and therapists will guide you on your journey. Our flagship wellness retreat is built around you. Initial Skype interviews, health screening tests and fitness assessments establish your goals and your baseline prior to the retreat. We then design a personal retreat program to set you on your way to revolutionising your health, wellness and fitness. Supported throughout by our expert team of fitness professionals, wellness instructors, clinicians, nutritionists and therapists; group sessions and small group activities will supplement your 1-1 time. And we ensure there is plenty of opportunity to relax, socialise and utilise the facilities at our stunning Chateau. You will leave with a personalised, practical and purposeful wellness program to continue your journey. Designed for those who want a relaxing, stress-free, long weekend break to re-energise and relax. It all starts for some with an optional night in Paris, staying at a boutique spa hotel near all the sights and sounds. The next lunchtime, a short train ride to Laval, and you arrive at Chateau de la Motte Henry, meeting up with guests who have chosen to arrive directly. During your stay you can enjoy complementary spa treatments, group exercise classes, morning and evening yoga, daily walks and picturesque cycle rides. Excursions to local sights, nearby spas and the famous local markets are also on the agenda. You may prefer to just chill at the Chateau, enjoy our pool and gym, and explore our glorious grounds. But make sure you are around for the sumptuous food on offer and evening sparkles. Exclusively for women. Prior to the retreat we will seek to appreciate your challenges and goals through a series of consultations (Skype or on-line) with our women's health team. Additionally, we may recommend an endocrine analysis. Such investigations do not take long and enable us to 'tailor-make' your retreat program - therapy, nutrition and support. Once 'on retreat' you can relax at our 'fairytale' Chateau and transition seemlessly into your program. There will be: delicious and nutritious meals; informative group seminars; therapeutic exercise classes; and enjoyable local excursions. At the same time you will benefit from personal therapy, a nutritional consultation, physical fitness review and feedback on your endocrine analysis. We aim for you to leave happy, healthy and positive, with great memories and 'informed wellbeing'. Retreat takes place 22nd-28th March 2019. Olympic Gold Medal Cyclist Dani Rowe (nee King) and her husband (and elite cyclist and coach) Mark Rowe will be in attendance. Exclusive seminars, members-only retreats and on-line resources. A chance to win 2 free places at our 2019 Running Retreats (2 adults, assumed to be sharing a double or double deluxe room). Assumes 2 guests sharing an ensuite, twin double room. Single supplement from £350. Groups will benefit from a discount. Based on a family of 4 sharing a suite. Larger families benefit from a discount. Assumes 1 person occupying en-suite, double room. Accompanying adults £3,000. Children welcome (pricing age appropriate and on request). Assumes 2 people sharing a twin room, single person supplement from £350. Larger group discounts. Assumes 2 people sharing twin, en-suite double room. Single person supplement from £300. Group discounts available. Assumes 2 people sharing twin, en-suite double room. Single person supplement from £250. Group discounts available. Assumes 2 people sharing twin, en-suite double room. Single person supplement from £400. Group discounts available. Assumes 2 people sharing twin, en-suite double room. Single person supplement from £200. Group discounts available. Parisian adventure £600pp.